Discover the Dalmatian beauty of Hvar and the Pakleni Islands on a private speedboat trip from Split. Cruise across the turquoise waters of the Adriatic Sea and stop to swim at Palmižana Bay. See the superyachts, go sightseeing, and finish with wine tasting in the fishing village of Milna on the isle of Brač. Onboard drinks and use of snorkel equipment are also included. Pricing is per group, based on a maximum of 8 people. Board your private speedboat from the Matejuska port in Split and set off on your full-day excursion to the Croatian island of Hvar. Following the boat ride, your personal guide leaves your party in the resort town for ample free time to get coffee or sightsee on your own. Next, you're taken to the tourist resort of Palmižana, located in the Pakleni Islands. Here, you’ll have time to swim and snorkel at leisure as well as to purchase lunch (own expense). 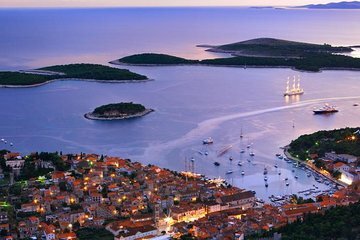 Afterward, take a panoramic ride around the islands and soak up the beauty of the Dalmatian coastline. With some luck you may even spot dolphins or sea turtles. Finish with a stop at Brač, another Croatian island in the Adriatic Sea. You’ll head to the picturesque fishing village of Milna for an included wine tasting before the return trip to Split.